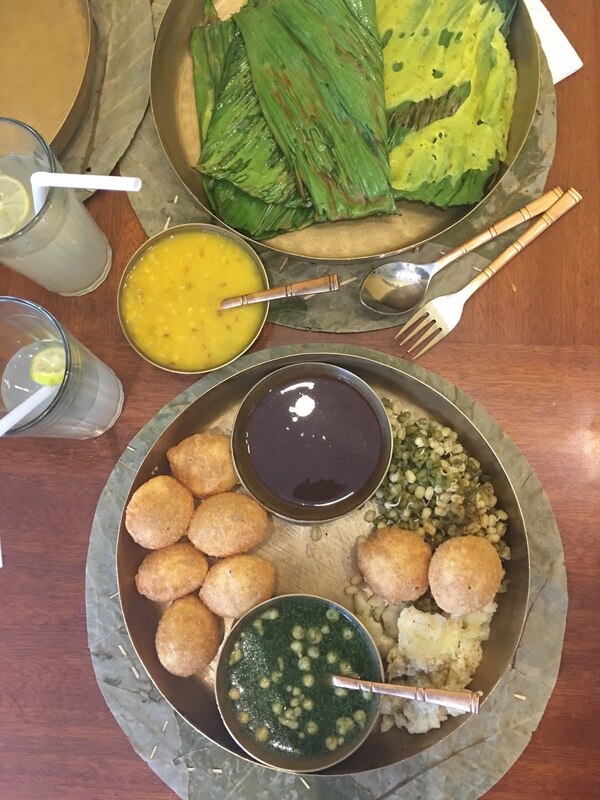 Mumbai essentials: buzzing new spots! This is my 4th post on the buzzing India city. Every time we go we find some new places. New discoveries and the old classics make the gastronomy during each trip a wonderful experience. Spending time with family, shopping & having fun in noisy Mumbai during the monsoon is unique. Mumbai has a tropical wet and dry climate. Monsoon is from June to August, and post monsoon are the best months to go: December to February. You can check my older posts on Mumbai here and here. One mix of Mumbai & Goa: click here. Let me now take you to our new discoveries as as enjoying the classics! Vada Pav: Mumbai Burger. Spicy potatoes tempered with musterd seeds and curry leaves, dipped in gram flour and fried. Those are the tasty Vadas served in pav , typical Mumbai bread and with red chilly garlic powder. Pani Puri: Explosive ball of tamarind, mint crispy & spicy! Panki: Steamed gram flour crepe served on a banana leaf. Take away Bao Haus CO. in Colaba! Best Mumbai Sandwich SNOWMAN'S Kemps Corner! Lovely hand crafter leather slippers: Kholapuris. Feeding the cows near the Hanuman Temple. And then snacking at Kailash Prabat! You can see bellow my favorite chaat: Dahi Batata Puri! Loved this Parsi Café: Soda Bottle Openerwala, of the Olive Group is an Irani modern café. It serves authentic Parsi food, in a casual young ambiance. No booking. Gets full at nights. Parsi, also spelled Parsee, member of a group of followers in India of the Iranian prophet Zoroaster. The Parsis, whose name means "Persians", are descended from Persian Zoroastrians who emigrated to India to avoid religious persecution by the Muslims. Wikipedia. Loved Haqq Se. The food served is Indian with a twist, original food. But the best part of it , is the ambiance. They had live music the day we went with an incredible band. The decoration and the quotes painted on the wall, the ambiance & the food makes it very cool. Cheese fondue served in puris! Great Fusion! Visiting the head office of Mumbai Smiles in Mumbai. I have collaborated with them various times and just admire the work they are doing , giving smiles to all. Keep Smiling and gifting smiles. Their NGO is based in Barcelona and their projects are all based in the slums of Mumbai. SONRISAS DE BOMBAY.